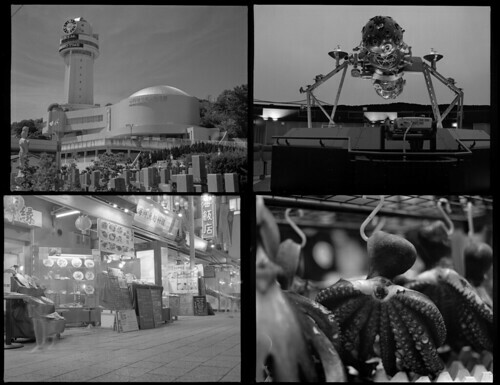 I bought a roll of Ilford Delta 100 a couple of months ago, and shot it two weeks ago as we went to Akashi. The results were great - really great; I may have found my new favourite film. My standard BW film is HP5, an iso 400 film that I often use at 800. Underexposed one stop like that it gives me fairly coarse grain and fairly low detail. Not that the lack of detail matters all that much; in medium format it still gives me more fine detail than my digital SLR, and plenty more than I need. I like the tonality, and at iso 800 there's enough speed to use it handheld in almost any situation. Up until now, my normal 100-speed black and white film has been Fuji Acros. It has very fine grain and high resolution, but it tends to look flat, grey and washed out. When it's good it's really good (example). But when it's bad it's hopeless (example). I've shot several rolls of it, but I still don't have a handle on how to reliably avoid those flat, lifeless results. Delta 100 really seems completely different. It has fine grain and resolution, just like Acros, but it has a much more pleasing contrast right from the start. The overall tonality is smooth and restful, and not at all flat. At the same time there's a sense of sharpness or "bite" to it that other films I've tried have lacked. Here's four unedited shots with Delta 100, developed in D-76. The top two - an outdoor scene and an indoor one - are properly exposed. The bottom exposures are overexposed and underexposed respectively. I've set the black and white point, but they're otherwise unprocessed. You can see the finished images in the previous post here. The good: You get pleasant, clear images right out of the box. I shot this roll at iso 100, then developed it using D-76 (ND-76, actually) mixed 1:1 for 11 minutes; that's straight from the instructions. Scan the images with no brightness or gamma adjustment, set the black and white point (that is, make the darkest points black and the brightest points white) and you get results like above. No other film I've tried has given me something as pleasant with so little effort. You can see the finished versions in my previous post about Akashi here. Note how little I've had to edit them; I mainly just increased global contrast a bit and adjusted the brightness as needed. Sharpen a bit at the end. No heroics, no noise or grain reduction and no tricks with local contrast or anything. Here's a sharpened crop of the planetarium from the original size image. The film holds a lot of detail, and the grain is hardly visible. The full image is 60Mp, but there's obviously not that much detail there. 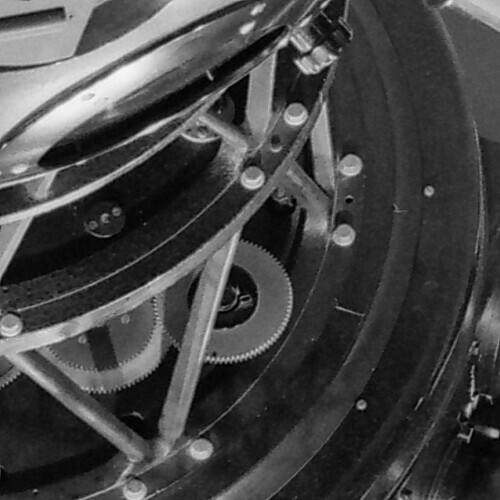 The scanner limits resolution to 30-35Mp or so; both the film and the lens is capable of more. As it is, if you see this on a normal monitor the whole image would be around 2 meters wide. Image resolution just isn't an issue for most of us any longer. The bad: The downside of this clarity is that the film becomes fairly sensitive to exposure. The toe (the dark end of exposure) and the shoulder (the bright end) both seem fairly pronounced. So if you underexpose, most of the image will end up in the toe and become quite dark and moody. If you overexpose, much of the image will become washed-out. This is exactly what's happened to the two bottom images in the unedited shots above. 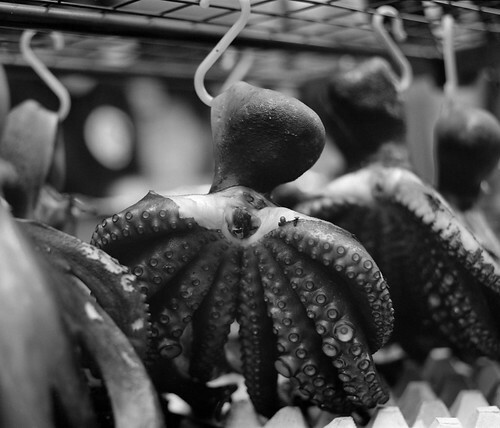 The octopus image is underexposed by about a stop, and the street scene is overexposed by perhaps two stops or so. Many films wouldn't bat an eye about such a small difference, but with this film it clearly matters. Good if you want this look on purpose of course, but if you don't it clearly pays to use a real light meter and make sure your exposure is right. I haven't tried playing with the processing, but I suspect the film is similarly sensitive to developing time and temperature as well. Another negative is that, well, it is an iso 100 film. This is fairly slow. Anything less than daylight will need fairly fast lenses or a tripod. And if you use filters, not even sunlight may be enough - the planetarium above was shot with a red filter, and the slow shutter speed and an unstable vantage point (I was leaning halfway through a hedge) was enough to cause some real motion blur in the image. 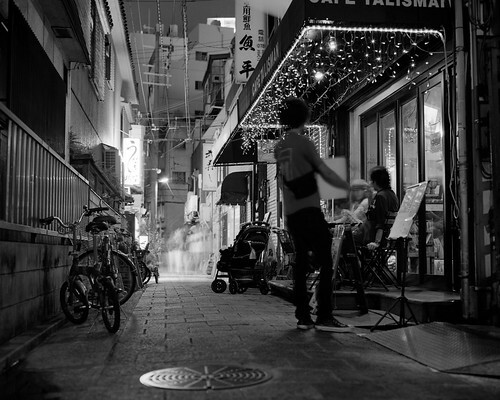 A long exposure shot - five seconds or so - of a Kobe backstreet. That's the good thing with lugging a tripod around: long exposures become as easy to do as short ones, and you end up with much better detail and clarity than if you use a high-speed film or high-iso setting on your digital camera. Serious, professional people - people who know what they're talking about - often say that a tripod is the single most effective thing you can get for improving your images. I believe they're right. I really like what I've seen of the film here, and I suspect it'd be great for doing landscapes and scenic shots, or long-exposure nighttime shots. You want lots of detail and your subject isn't going to be moving about a lot. I'm not sure how good this would be for street photography. At dusk or away from daylight people moving about will start to blur, and you can forget using this indoors without a tripod. Delta 100 seems a very good fit for a high-quality medium-format (or large format I guess - I'd love to find out) camera like the Pentax 67. The optics can make good use of the high resolution and the lenses are fast enough to let you use the film handheld in daylight. For low light you need a tripod, but that's something you often use with this kind of camera anyway. 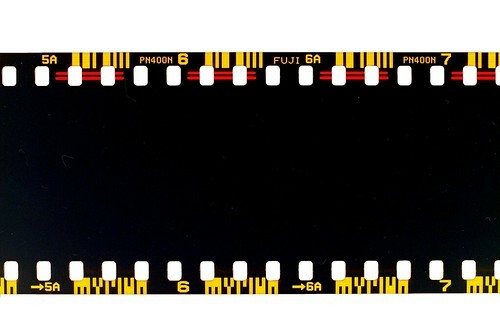 It should be a good choice for a high-quality 35mm camera, for much the same reasons, and the fine grain and high resolution should help get the most out of the small film format. I should try it on the Minolta I have, or on the Canon SLR; a Leica or some other M-mount rangefinder should work very well too. I wouldn't waste this film on cameras like the Voigtländer Bessa or Rollei 35. 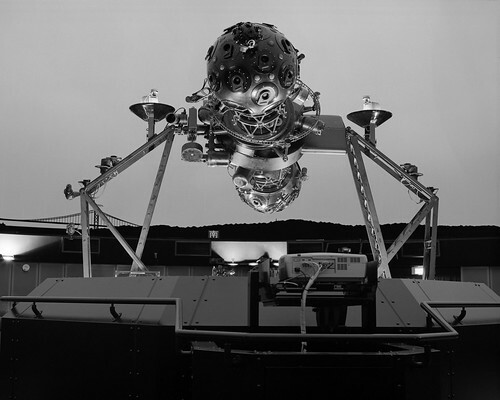 They're scale focusing cameras and best shot stopped down a fair bit. They'll usually be a bit out of focus, and the Voigtländer lens especially isn't all that sharp or contrasty. The high resolution of the film is wasted on them, and the low film speed is a real handicap as these cameras are best used handheld and stopped down to f/8 or less. For street shooting and for old cameras with iffy optics I believe HP5 is a better choice. It's fast and it's easy to push with good results. But high-quality landscapes, daytime scenery or nighttime tripod shots with high-quality cameras is where I think Delta 100 should shine. We'll see if I still agree after I've used it for a while. 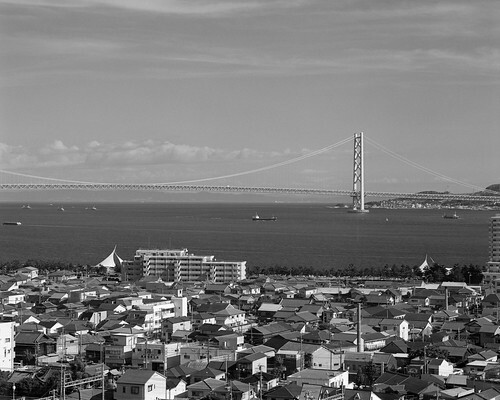 Akashi is a town west of Kobe along the Seto inland sea cost. We went there a week ago, on the first day of high summer when the rainy season had just been declared over. 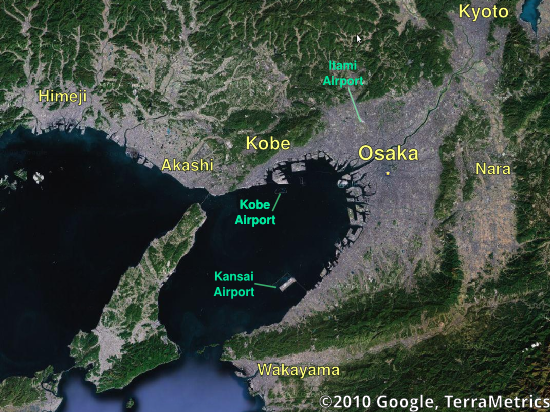 Akashi is a separate town, of course, with a population of around 300 000. But the whole coast, from Manaitashi mountain south of Kansai airport up to Himeji in the west, really is all one urban settlement. It's only the street-signs that tell you when you leave one town and enter another. 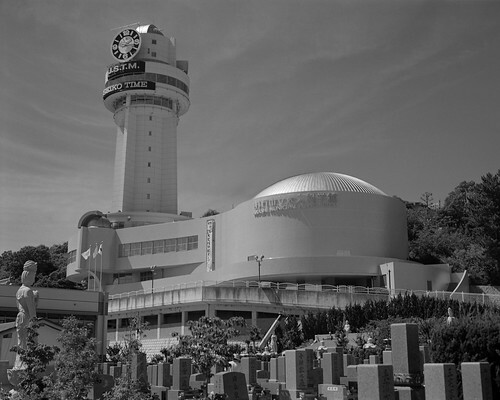 Like many smaller cities, Akashi has no reason to be world famous or even to be widely known. That doesn't mean there's no reason to visit. It is a fishing port, so there's plenty of good seafood, and especially eel and octopus. We had eel for lunch; next time I'll have to try the Akashiyaki, takoyaki with a dipping soup. Another speciality worth checking out is Ikanago, tiny dried fish marinated in soy sauce to use as a rice topping. Delicious. The Akashi Strait Bridge to Awaji island, then on to Shikoku. The bridge itself is on the Kobe side of the border, despite the name. Grilled octopuses for sale along Sakana no Tana, a shopping street with lots of fish and other foods. 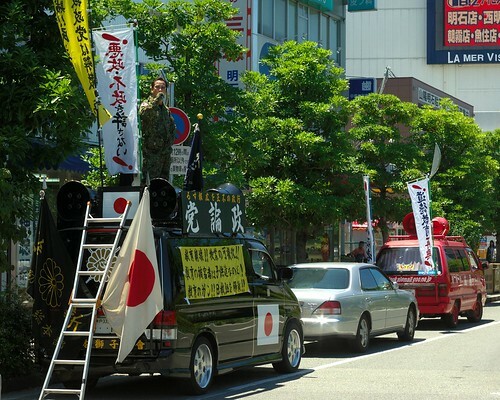 Not specific to Akashi of course, but there was a right-winger truck parked by the train station, and this guy was on the roof giving a speech. This is fairly unusual; they normally just blare some taped message mixed with martial music while they drive around. The glaring absence of crowds jostling to hear him - or of even one single person but me giving him a second look - may point to a reason they don't. Having just a single foreigner giving him attention can't have done much for his self esteem; he obligingly turned toward me for the picture, though. Akashi stands right on the 135th meridian, from which Japan counts its standard time. The city has a quite good planetarium on the meridian with a small but fun clock- and astronomy-related museum, and a good view of the city and the strait from the view atop the tower. There is also a small observatory at the top, but it is only occasionally open to the public, and was closed when we came by. We're done putting stuff in jars. New this year is pickled ginger and blueberry liqueur. The ginger is ready to eat already - and it is delicious - though it will keep for a year. The blueberry liqueur needs about eight weeks like this before we remove the berries (we'll make jam with them) and let the liqueur sit for another month or two to stabilize. We still need to dry the umeboshi and let them soak, so they'll take another couple of months as well. The brandy umeshu needs to sit for at least a year. But at the rate we drink the stuff - we're still on the last of the umeshu from two years ago - I guess it'll take up to three years before we open this jar. The flavour should be pretty spectacular by then. 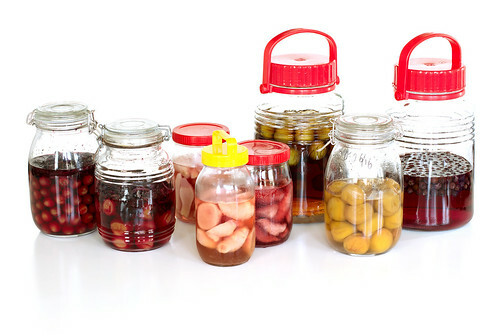 From left: umeboshi with shiso (two jars); ginger pickled in salt (two jars) and in umeboshi juice; brandy umeshu; umeboshi; blueberry liqueur. 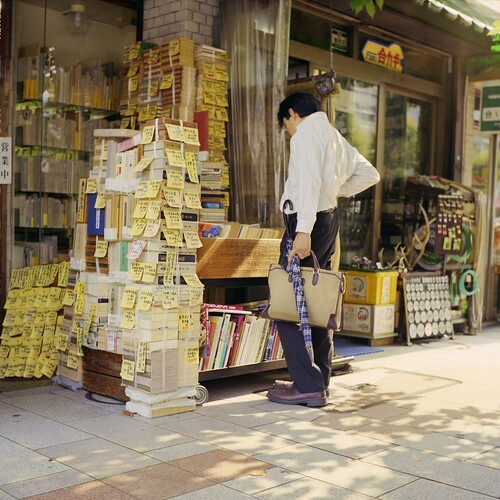 I renewed my passport in Tokyo a few weeks ago, and I took the Yashica along. The Swedish embassy is in Roppongi, so you change subway lines in Meguro. Any embassy design is going to be playing off their national stereotypes of course. 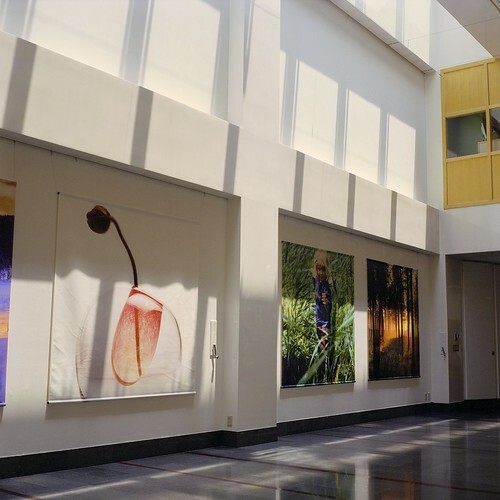 The entrance at the Swedish embassy does "Nordic minimalism" and modern design. A better choice than Dala horses and folkloric kitsch: look forward, not back. A refreshing detail: no flags and no patriotic slogans. I mean, you presumably know which embassy you're at already so why add some big colorful marker to remind you? Oh, and we're technically a monarchy, but there's not a single portrait of the king, or the royal family. There's some aspects of my home culture that I really, really appreciate, and the lack of unthinking, noisy patriotism is one of them. While there were no cheap symbolism at the embassy, Restaurant Stockholm feels no such inhibitions. Still, it's a pleasant place with a fairly good Smörgåsbord. Lunch is not too expensive and Swedish passport holders get a nice discount. My only gripe is that they don't do Janssons temptation during summer. Oh well, it's pretty easy to make yourself. Perhaps post a recipe? You can't go to Tokyo and not stop by Jimbōcho in Kanda. The area is filled with used book stores, and it's a treat to spend some time there. Most books are in Japanese of course, but there's a few places specializing in foreign-language books. 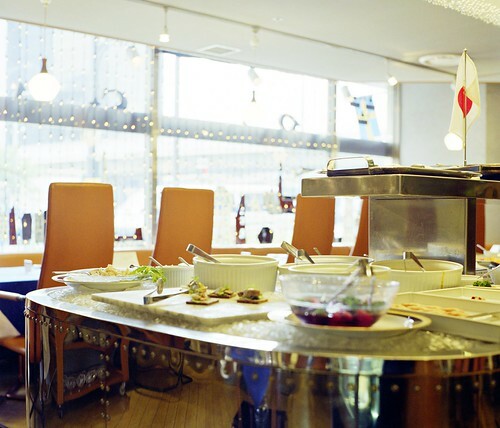 A must-go place is Meirinkan, a store that specializes in science and technology works. Again, mostly Japanese but they have a pretty good collection of mathematics in English. I was very good and bought only half a dozen or so, including a good two-volume work on numerical analysis and a book on using sensors in electronics. Kandabashi. 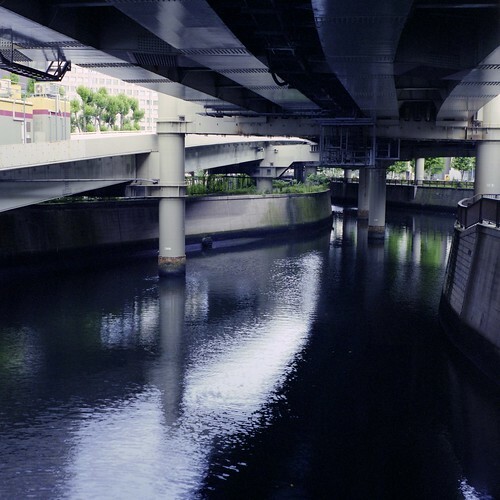 Osaka isn't the only place to use its canals as convenient places for highways. I'm torn about this kind of thing. On one hand, you hide away what could be a pleasant waterway through the city. On the other, this kind of industrial brutalism looks pretty cool. 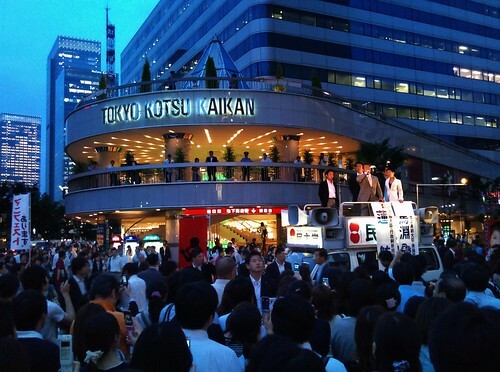 The area east of Tokyo station has become fairly upscale. 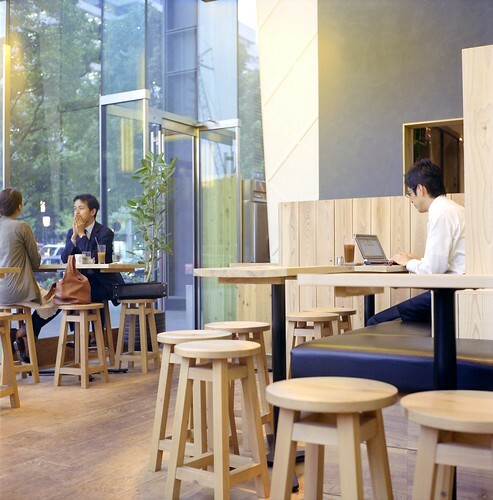 Here's a beer cafe in one of the large office buildings right next to the station. Good place. The upper-house election was in full swing. Here Renhō, a very popular DPJ politician, was giving a speech in Yurakuchō. A few days later we spotted her in Osaka, stumping for one of the candidates there. Excuse the image quality; it's a cellphone shot, at dusk, with the phone held over my head. I'm amazed there's anything recognizable in the picture at all. 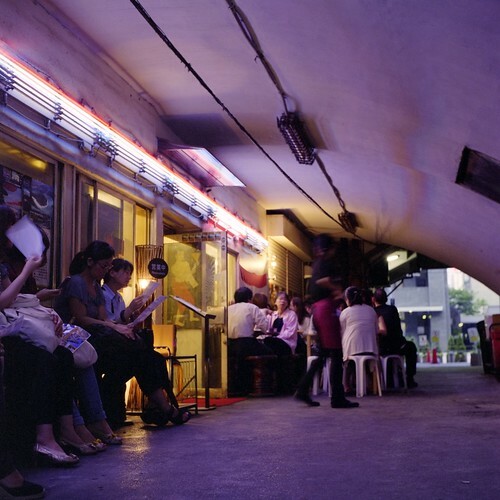 A popular Thai restaurant under the Yamanote line tracks. The lighting and plastic chairs makes it feel very south-Asian in style. The food looked great but the wait was too long for us. One thing I envy Tokyo is all the cheap, low-grade but friendly eating places under the tracks of the Yamanote loop line especially. 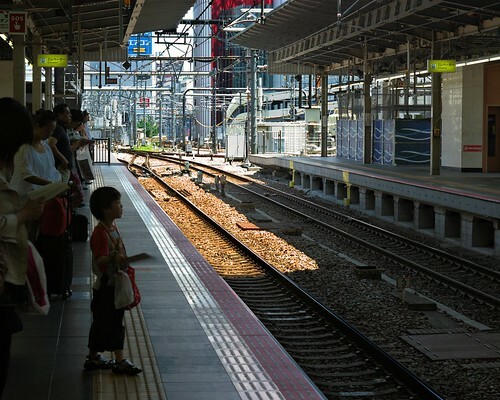 They cluster around the stations, and especially where you'd have lots of employees passing through every evening. Namba in Osaka just doesn't have a lot of places like that. Perhaps it's simply the relative lack of elevated train lines, but I think it's a difference in style too. There's plenty of cheap eateries here too, just not this kind. Upper house election is done, and a loss - a fair, well-deserved loss - for the DPJ. They would have needed 60 seats to get full control over the house, and 54 seats to keep their pre-election numbers. They got only 44, a net loss of ten seats. This is an indictment on the incompetent rule of Hatoyama for the past year, of course, but also pretty much a vote of no-confidence in new leader Kan, who has exhibited a tin-ear for public discourse and managed to disillusion his supporters in just a few short weeks. Is there something in the water at DPJ headquarters that makes their leaders lose about 50 points of IQ and any political sense the moment they get elected? Or is it simply that the kind of personality and abilities that will get you to the highest ranks of the party are a liability for the specific job of Prime Minister, who, after all, is primarily a salesman and PR representative rather than a policy wonk. Their former coalition partner PNP lost all three seats they had before the election - half the seats they have in the upper house. The Communist party and Social democratic party each lost one seat, continuing their slow decline. The New Komeito lost two seats; they haven't been able to capitalize on the woes of the ruling block. The short-term winner is the LDP, who picked up 13 seats. Their support base seems to shift ever stronger toward the rural and peripheral areas of the country, though, which is not a political growth area in any sense of the word. And long-term, this result is rather bad for the LDP. They party has managed to avoid any serious self-reflection or any reform of their own policies and party structure after the disaster last year, and with this bump any chance of serious reform is likely gone. Their current leader Whatshisname is sure to stay on, as is most of their old guard. And without real reform and structural change the party is probably doomed to become a second-tier party long term, perhaps a special-interest party for the rural periphery. The real winner this time was Here Comes Everybody Your Party, who went from one seat to eleven in this election, winning one more seat than the New Komeito. They've become the fourth largest party in the upper house, and are aiming at replacing New Komeito as the new third alternative. It's still a long shot, but they could well become the new center-right in Japanese politics, especially as neither the LDP nor the DPJ has shown much ability to step up to the current political challenges. Which, in my mind, leaves a rather large gap: A moderate, rational center right is being formed, but where is its counterpart? The traditional left is in long-term decline, while attitude polls show there's a fairly large constituency that is very sympathetic to a moderate left. Seems to me that there should be a market opening here for a new social liberal party that nobody is yet stepping up to fill. Lots - and much better - election comments from σ1, Shisaku, Dispatch Japan, and Observing Japan. It's election day in Japan today. Rain is pouring over Osaka, which means low turnout and a boost for the DPJ as protest voters stay home - or a loss for the DPJ as disillusioned supporters don't bother voting. Whichever happens, they will not get an outright majority in the upper house, but will have to refine their art of coalition governing. With whom is an open question; but when actual power is in the offing there's rarely any shortage of willing candidates. Meanwhile, in Sweden the election campaign proper has kicked off with the traditional Almedalen Week. Every year around this time - and especially on election years - all the major parties, press and television, lobbyists, economic and political wonks, NPO's and political organizations descend on Almedalen1 in Visby on the island of Gotland, a week of policy speeches, election promises, planted leaks, badmouthing your opponents and so on. Think of it as a combination of election manifesto presentations and months worth of countrywide speaker-van platitudes and blog punditry all concentrated into one place and a few days. the anti-EU Communist party - and to a lesser extent the EU-sceptical Green Party - have had to completely abandon their stance in the interest of the coalition with the Social Democrats. That's going to disappoint a fair number of their more recent supporters, as leaving EU has been a high-profile vote-getter issue for them. It also means there is no mainstream party left for those EU sceptics - a dwindling number, but still - that want concrete steps toward leaving the union. The Moderates and Social Democrats are both perfecting the art of "triangulation", and taking over each other's political issues. A few more election cycles like this and they'll be all but completely interchangeable. Also, political commentators seem to mostly agree that the Christian Democrats attempt to widen their support base by talking about "real people" isn't working; and that reminding people about their religious origins and basis of their policies is off-putting to voters. So, on one hand they can't rally their base (the kind of people who think the Earth is 4000 years old) without scaring off moderate, non-religious conservatives, and they seem unable to actually build a non-sectarian moral conservative base on the other. And they can't simply rely on their base the way New Komeito does, as it's simply not large enough to get over the 4% limit and give them a seat in parliament. They spent 20 years out of parliament before they learned they had to reach beyond their religious base, and they'll get dumped outside again the moment they forget. #1 Why Almedalen? One Prime Minister liked to take his summer vacation on Gotland, and started giving a summer speech to the local party faithful since he was there anyway. The event grew over time into this unofficial election kick-off. It's a shame, in a way, that he didn't like northern trekking - it would've been fun to see a thousand-people lemming train of politicians, lobbyists and press in plaid shirts and backpacks slowly working their way over some bare mountain pass in the far northern mountains every year. The consumption tax in Japan - now at 5% - needs to increase, everyone knows that. A month ago, give or take, the opposition LDP suggested an increase to 10% in order to help finance social services. The new DPJ president and prime minister Kan ran with it, suggesting a 10% increase. The public is fairly split, but with half the public agreeing that a raise is necessary. So, we have the two largest parties and half the public in principal agreement on both the need to increase the tax and a rough idea on the rate. It is a fairly simple, self-contained issue with as wide support as any tax-related question is ever likely to get. And what happens? Negative media polls, opposition from retail industry, the LDP contradicting its own platform to score election points, party infighting and jumpy election strategists are now effectively killing the whole thing. But if a simple, relatively uncontroversial, widely-supported measure like this can't get enacted, then what chance do far more disruptive and controversial issues have? Pension and social security systems will need to be reformed and sooner rather than later. So does the election system (pushed in part by lawsuits); the political and economic relationship between Tokyo, the other urban centers and the rural areas, and many other issues. They'll all be politically far more difficult than a simple tax increase. If addressing any such difficult issues is proving impossible in the current system, then Japan will be in for a very rough economic and political ride in the future. Check your spelling. Check your mail. Check your breasts and testicles for lumps. No cross-checking. Check mate. Check your moles and birthmarks. Check your luggage. Take a rain check. Check your eyes. Check your teeth. Check your list, twice. The Czech is in the male. Check in. Check out. Check it off. Check it out. Check please. And check your passport. Check it well before your trip, and check it even if you're already sure it's fine. I'm going on a business trip later this summer, and I thought was all set in the passport department. My visas are current, my re-entry permit is good and the passport itself is valid for another three years. Ritsuko took a quick look anyway..
..and the first page - the hard, laminated page with your picture and data on it - has cracked along the spine, where the page folds. It looks like the page could break loose the next time an inspector as much as looks at it funny. It's a manufacturing defect in these older passports and you should get a new one at the first sign of this happening. So, I need a new passport. We discovered this in time, fortunately, so there should be no problem getting a new one before the trip. It's still a hassle, though; the only place where I can apply for a new passport is the Swedish embassy in Roppongi in Tokyo, about four hours total by train and subway. You have to apply in person and you can't do it at the consulate in Kobe, as they use some specific equipment to take your picture and fingerprints. Early tomorrow morning I'm off to Tokyo and my very first visit to the Swedish embassy. Which is sure to be as breathlessly exciting as it sounds. I am already steeling myself for the inevitable posters of Dala Horses, maypoles and backlit shots of sailboats against the midnight sun. They'll send all data to Sweden, where a new passport is made and sent to Tokyo. It should take a few weeks. I need to pick up the passport in person, but that is still possible to do via the consulate. I'll go to Kobe for the new passport, then directly to the immigration office in Osaka to have my visas and stuff transferred from the old one. I should have it all finished in plenty of time. Which, again, is the point of this post: I have plenty of time because I1 actually checked the passport. It would have been distinctly not-amusing to see my front page detach, flutter happily through the air and gently land at the feet of some French passport inspector with a toothache, a third divorce and no sense of humour. While a day or two in a French immigrant holding facility would be an interesting experience, I'd just rather go to my intended destination if I can help it. #1 Well, Ritsuko did. As long as at least one of us remembers to check things like this we'll be fine.